packed lunch.. Or to have it as a breakfast. 1.Place cumin seeds and black peppercons in an electric blender or mixer. Blend into a coarse powder. 2.Split the cashews in half. Saute in 2 tbsp of ghee until golden colour. Set both aside. 3.In a heavy sauce pan, dry roast the rice and moong dal separately , about 5 mins each. 4.Wash both rice and moong dal well. Mix together and place in a Pressure cooker. 5.Add ground turmeric and 4 1/2 cups water. Pressure cook for 4 whistles. reduce the heat .Simmer for 5 min until soft. 6.Switch off the flame and set aside. 7.Heat the remaining ghee and oil in a heavy frying pan or skillet. 8.Add cumin seeds and peppercons ,powder, grated ginger and a few curry leaves. Saute for 1 minute. 9.Add pressure cooked rice and dal, salt to taste and grated coconut. Mix well. If necessary, add 1/2 cup water. 10.Garnish with sauted cashews. 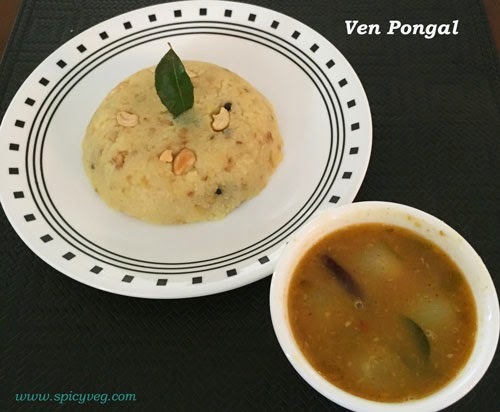 Serve hot with any coconut chuney or Onion Sambar.